Hello, I am Sheila from AccessArt – who here has heard of AccessArt? Wonderful if you have, but please don’t worry if you have not – thank you to Speada and Sara for giving me the opportunity to tell you a bit more about our growing charity, the work that we do and how, we hope, that we can support you in giving your pupils the very best creative offer your school possibly can, and the skills that they need to achieve their creative potential. Fully. A little introduction – Paula Briggs and I have been working together since just after finishing the RCA sculpture school in 1994 and both coincidentally moving to Cambridge. 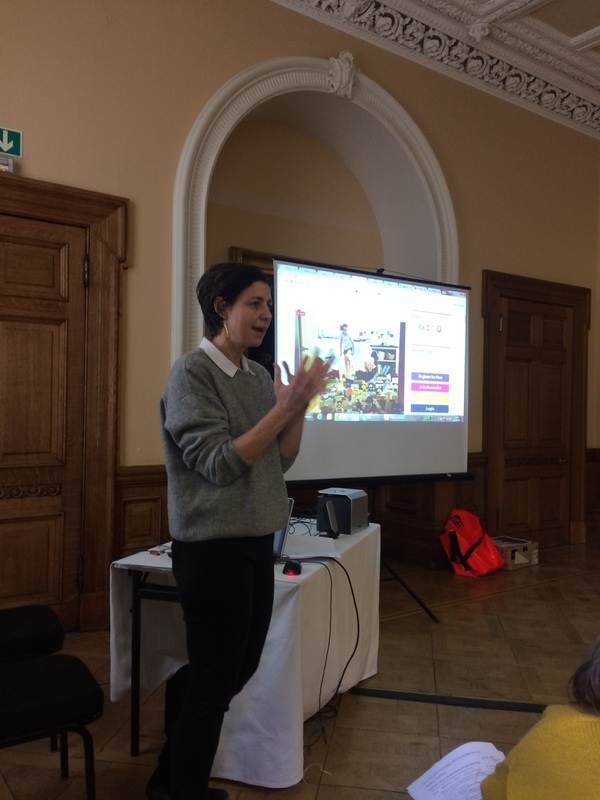 We started on the ground via our first organisation – Cambridge Sculpture Workshops, 23 years ago, working in schools, museums and galleries and forming relationships with influential organisations which are still important, and inspiring to us now – like NSEAD and Engage – Lesley – what an honour to be here with you today! Paula and I, then saw the then new internet and recognised that we had before us the perfect platform to fill the great need to support, enrich and promote creativity in schools and enlarge our campaign for making, so we set up “AccessArt” and have been going ever since. We feel that we are as needed now, as we were then – arguably more. AccessArt is more an ideas bank full of open-ended creative approaches to facilitating and developing fine-art skills and creative thinking – it’s a place where we hope ideas are planted, which you can then take away and develop and change/adapt as your own. It’s also full of practical tips such as how to set up an art room, curriculum advise, around all areas of fine-art from drawing, sketchbooks, colour, printmaking and making – it covers how to hold a pencil (or not) – and lots of campaigns and participatory projects – including our latest campaign ‘Brilliant Makers,’ and project, the AccessArt Village, which is now on tour nationwide. Resources are primarily created by artists for teachers and all based on actual workshops or classroom sessions and all written and illustrated with the aim of enabling and enriching creativity. We now have more than 750 AccessArt posts and last year were seen by half a million users – we have 15,000 subscribers and almost 2200 members. I understand from Sara, that I am preaching to the converted in this room – so I do apologise – I suppose, what I want to do is reassure and give confidence that, by supporting your children’s creativity – you are wholly on the right track. Jack Ma addressed the world economic forum last month and said “that only by changing education can children compete with machines” – he was not talking about the nation’s education strategy – but the world’s – he made the argument that with machine learning and search engines, that our view about, not just what we teach but why we teach – needed to shift and that role of education was going to fundamentally change. For two hundred years, until now – education has been primarily about factual learning – but Mr. Ma said “we now need to teach, compassion, empathy and lots and lots of Art’ – creativity and empathy are the things that machines simply, will never be able to do. But it’s hard, and not helped by governmental emphasis on Science, Technology, Engineering, Maths and literacy targets and strategies, which despite going against many educationalists’ instincts – (not that the ambition to produce scientists and engineers is not applaudable), but not to the exclusion of Art and creativity. Everyone in this room knows, that’s counterintuitive, and anybody who has engaged in creative activity – of any kind, knows that to create is to think, feel and communicate – apart from the fact that, if we want to produce a generation of engineers and scientists it would actually be helpful if they were creative and innovative! So just to say, that even if sometimes you have the feeling you’re swimming against the tide – you are absolutely right to be seeking to improve your school’s creative offer. Absolutely right. However, unlike numeracy and literacy, there is no over arching strategy, at governmental level to ensure that children reach competency targets in Creativity – and actually – we would argue that children come away from primary school, de-skilled creatively and often hugely lacking confidence in their ability and even right to create. Well, it is true, like in any other area of learning, you do have people with talent – but really that way of thinking is farcical – you don’t not teach maths to the numerically talented? Or not teach English to children who can spell. Likewise, you don’t only teach maths to the numerically talented, or only teach English to the children who can spell. It just doesn’t make sense educationally. And remember – that United Nations states that Creativity is a Human right. We are all creative and we all have a right to express ourselves creatively. And, on a strategic, (governmental) level, of course quite gamble, as, I’m sure you know, creative industry, is the fastest growing one in the country, and the third largest sector – and one that there is likely not going to be the pipeline through our schools to fill. Creative skills, like everything, take experience and practise to develop and mature. Even the most naturally gifted need to develop their creative thinking and expressive skills to truly reach their potential, and everybody else does too. Take risks, experiment, explore, imagine, interpret, play, communicate etc. And incredibly importantly, be able to interpret other peoples’ work, communicating and talking about what they’re seeing. All these overreaching targets – or this wish list of skills for our children, takes time and practise for them to develop – and pupils can not be expected to magically have skills in place, ready for secondary school challenges, if they’ve not had rich experiences at primary school – and plenty of them. So then, if we’re all in, and agree these are useful skills for our budding future creatives and thinkers, then this moves on to the next hurdle, and one that Paula talks about in her book Make, Build, Create, Sculpture Projects for Children (published by Black Dog) – that making and art is messy and hard to control and very difficult to manage in the classroom Which again – points us to saying that if we know that by teaching Art, and creative thinking, you are fulfilling your obligation as an educator – then it would be easier to do – because the school, and even extended community would be geared up to supporting and enabling you to do it. So, we’re all behind you – what can we start to put into place to help you? Who are the people in your community who can help you? What changes can be made to the school’s physical space or timetable to enable making and creativity to happen. Do you need an Art space with a sink, storage, materials, more time? I’m sure that many of those questions will be answered by Sara and her team today. But, my final question for you, as educators, is how can we implement all of this, without getting bogged down into ‘measure’ and ‘evaluation,’ both of the child and the school? I would go with a very old fashioned model, not unlike when I was child in the 70’s, where it is taken on face value that creativity is integrated into every day learning, so that skills can be nurtured and developed, without pressures of assessment. Be mindful that creativity is something very, very hard to measure and easily lost when not celebrated. Through our creative endeavours we’re at our most open, honest and sensitive and most vulnerable to criticism. Our creativity is something we should trust and be able to fall back on during our hardest challenges, throughout our lives. So, as teachers I feel that while campaigning for creativity to be valued and recognised as the most powerful learning and expressive tool – it is also respected and nurtured as a very delicate and highly fragile process. It’s very important that as educators we learn how to recognise a process for what it is and not put our own cultural or aesthetic constraints onto interpreting a child’s work – but recognise that every act of creativity or creative action – any impulse to make a mark, is potentially important in creating the next generation of innovative, creative producers. Collectively, we need to examine and implement, what is it in the childhood soup of experiences that forms the creative thinkers and doers of the future, and how we, as educators create the right environment for them to flourish. Thank you for listening – Please do have a look at AccessArt, as we’re here to help you – let us know what you’re doing in the classroom, because we’d love to share what you do too. And, please do sign the Brilliant Makers Pledge – to show your support for making in schools – the more names behind us the better! I’m around all day and very happy to show you the website and tell you more about us if that’s helpful and open to answer any questions too. Thank you again for listening and Sara for inviting us here today. Please join in the discussion and share your thoughts in the comments below. This entry was posted in Uncategorized on March 5, 2018 by spaedablog.